I don't think there was much sealer left but since I'm planning to apply a TiqueWash I needed to ensure all the sealer is removed so I used the Concrete and Paver Sealer stripper. I completed one section and it turned white. Please see the attached photos. I tried re-stripping the section and additional sections and then used the cleaner degreaser. The concrete still has a "white" washed out look and does not darken when wet. In the attached photo, the concrete is wet and top section is stripped and the bottom is not. Do you think there is still more sealer to be removed? Or is it stripped and this is normal and can apply the "TiqueWash" colorant? It looks pretty much stripped. Can you do a test post of the colorant to make sure it takes? yes, i'll give that a try. Thanks. No. You need a pressure washer. 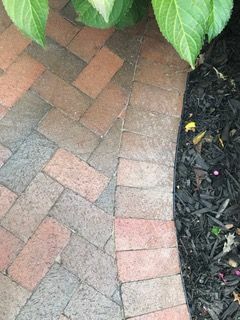 Does all the old polymeric sand need to be removed during pressure washing and do you recommend a different joint sand before resealing? 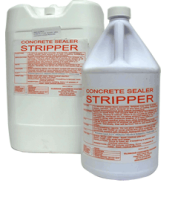 Final question, what is the difference between the $42/gallon paver stripper and the $181/gallon, or did I misread something? Thank you. No need to remove all between the joints but best to stay with a poly sand if all is not removed. It will bond better. These spots have appeared on my newly sealed clay pavers. What are they and how can they be removed? Cannot tell from these pics. Too small of resolution to see properly. what I meant to say is, do the pavers need to be cool to the touch or does too much heat matter. Cover the fence to be safe. Later in the day or out of direct sunlight is best. What time of day should I apply the stripper. The directions on the can does not indicate it. Also, one side of my walkway is next to my pvc fence. Should I cover the fence. Thank you. How far will one gallon go? I have a driveway, and a very long walkway from the front of the house to the back, say abut 40 feet. 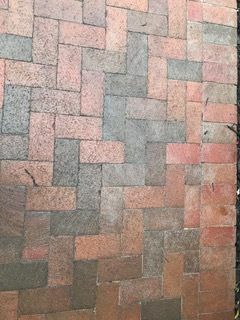 My pavers turned a milky color when I applied a sealer. I don't want to order the 5 gallon because I'm afraid it might not work and I don't want to spend all this. money. Do you guarantee results. One gallon covers about 100 Sq feet. It works if done correctly. Will this work on sidewalk pavers and on bricks on the porch that have Super Diamond Clear sealer on them. What type of roller should be used to apply the Clemens stripper to the pavers? 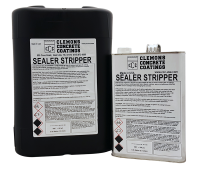 Use a roller that can handle solvent-based products. 5/8" to 3/4". We have Valspar Wet look sealer on our pool deck, they used the wrong product, and now our pool deck is slippery when wet. 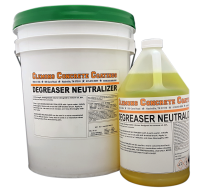 We have dyed terracotta color concrete will this stripper remove the sealer and not effect the color of the concrete? Any other suggestions would be appreciated as well. It will strip it but it is possible some of the color will be removed if the dye is at the surface of the concrete. There would be no way around this. We have flagstone coping that we used around our pool, and sealed with an Aldon sealer. It turned white and looks horrible, they say it was the chemicals. Will this take it off and is safe for the pool and flagstone? 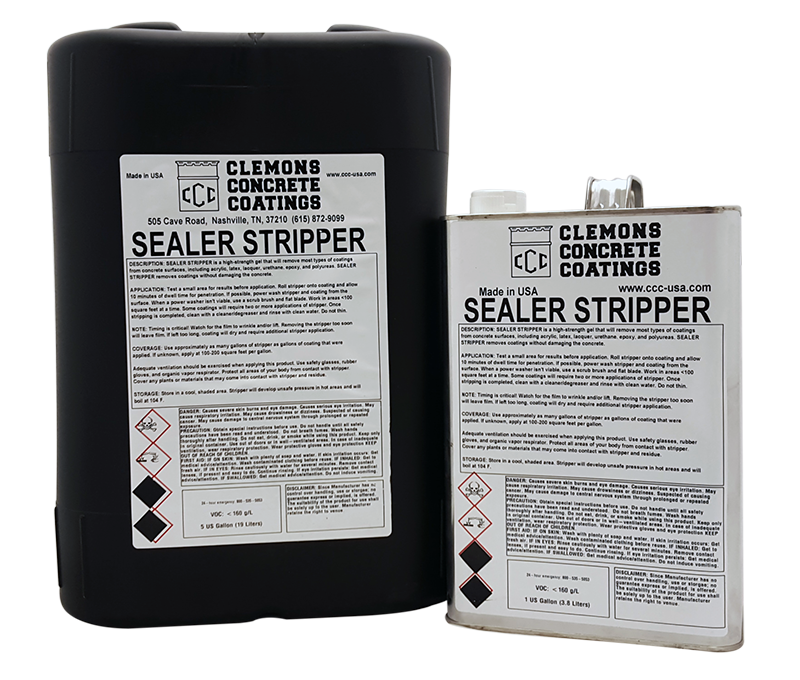 It should take it off but you cannot get the stripper or the residue of the old sealer into the pool. I live in Las vegas and would like to apply a sealant to my concrete pavers that has a wet look with a semi or high gloss finish. From what I have read I feel that a solvent based sealant would be best suited for my desired look. I have also read that many of the resins in solvent based sealants turn yellow when expose to plenty of sunshine. A local supplier also suggested this may happen when using solvent based sealant. Can you recommend a product that is resistant to discoloration caused by uv? Super seal 25 or the Super seal 30. Best to dilute the soil heavily with water before and after you are done. No need to neutralize the soil. If the stripper gets on the painted wood, it will remove the paint. should be no issues with the rock and mortar on the siding. I have read your comments on taking precaution so that non of the stripper gets on plants, but my question is, what about the soil near the plants? Should I dilute the soil with water before and after if any drains into the soil (probably will)? Or is it too caustic to let the plants even get a little bit of it? Should I use baking soda (not too much I assume) to neutralize the soil afterwards? Before? The plants are literally four to six inches away from the patio. Another thing, what about wood? There are a few painted (acrylic paint I think) wood pillars on the patio. I assume I will cover them, but if any seeps under the plastic will it damage the wood/paint? And one more thing, the siding on the house is rock and mortar. Will this stripper cause damage to it? Also, I will be power washing away from the edge of the patio so as not to introduce any solvent to the flower bed next to it as best I can. I would like to not cause any water damage/get-too-wet the inside of the exterior wall. My question is, do you know of these types of walls to be extremely porous/prone to leakage? I will be covering the wall too, but power washing directly across the patio surface towards the wall will no doubt get the wall wet regardless of the plastic covering it. Thanks so much. I look forward to your reply!